A lot of people want to eat more healthily, but it can seem like a daunting task. What does healthy eating even mean? Clean eating? ‘Natural’? Organic? Vegetarian? Paleo? There are so many conflicting ideas about what constitutes a healthy diet that it can feel overwhelming. Add to that the fact that not everyone has Cordon Bleu culinary skills, and the whole idea of eating healthily can seem intimidating. So how can you improve your diet without the confusion and anxiety that sometimes comes along for the ride? The answer – make one small, simple change. That’s it. Just one. And when that change is firmly established in your routine, you can think about making a second small, simple change. So what should that first small change be? It really depends on what you are currently eating. But if there is one thing that most of us could do to improve our diet, it is to eat more vegetables, especially leafy greens. 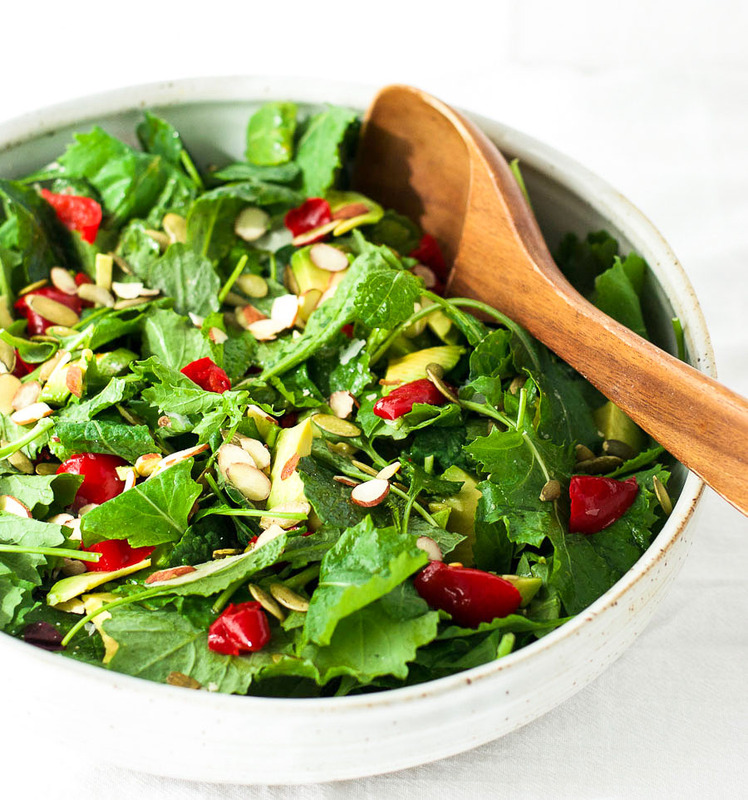 One small, simple change could be adding a leafy green salad to your diet a few days each week. 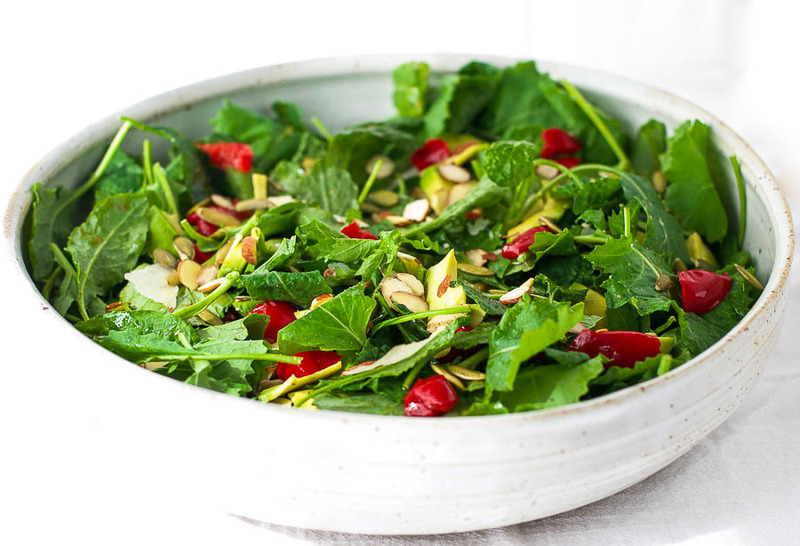 This very simple lemon kale salad is a great way to start. There is no cooking required, just some simple assembly. It is extremely nutritious and full of delicious flavors. You can also customize it. You could substitute arugula for baby kale, roasted bell pepper for the cherry peppers if you don’t like spice, or omit the parmesan if you want to make it vegan. The possibilities are endless. And because this salad is packed with healthy fats, fiber, and protein, it will keep you feeling satisfied as you embark on your journey to improve your diet. Place a skillet over a medium-low heat. Add the almonds and lightly toast until golden brown. Remove from the heat*. 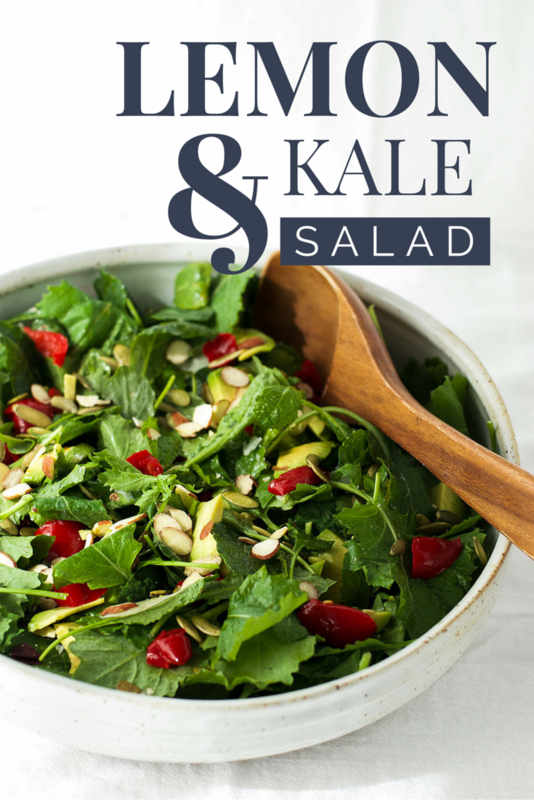 Place the kale, avocado, cherry peppers, almonds, pumpkin seeds, and parmesan in a large bowl. In a small bowl, whisk together the olive oil, lemon juice, balsamic vinegar, dijon mustard, a pinch of salt, and a few grinds of black pepper. Pour the dressing over the salad, and gently toss to coat the ingredients. *The first step is optional, but gives the almonds a nice flavor. Great salad idea! Never thought about blending kale with lemon. Looks refreshingly tasty. The lemon and kale taste amazing together. Thx!